The Kakapo is also called the Owl Parrot. It lives in New Zealand and it is highly endangered. It is a large parrot – the largest in the world. It can’t fly, and is active at night. It has a layer of yellow-green feathers with a fine blotchy pattern. It has a large grey beak and short but large feet. Their wings and tail are quite short for their size. The ends of their tail feathers often become worn out because they are always being dragged around on the ground. Their claws are useful for climbing. They are good climber. They are the only parrot in the world which cannot fly. So, it is alright for them to have short wings. Since they cannot fly, they do not have a keel bone that the flight muscles attach to, like flying birds do. It uses its short wings to balance itself, and also to support and to break its fall when leaping from trees. The Kakapo can store up a large amount of energy in its body, and grows very big and fat. It is the heaviest parrot in the world. 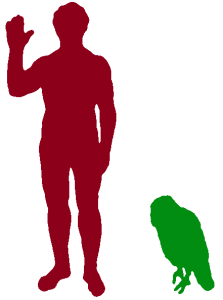 The male measures up up 60cm (24in) and weighs between 2 and 4kg (4.5-9lb). The Kakapo has a good sense of smell. It is a vegetarian. It eats leaves, seeds, fruits and pollens. Its favourite food is the fruit of Rimu tree. 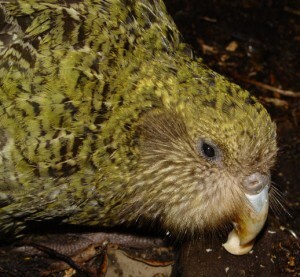 The female Kakapo lays up to 3 eggs each time. She nests on the ground under some plants or in cavities such as in the hollow tree trunks. She does not lay her eggs every year. Therefore, the Kakapo has one of the lowest rates of reproduction among all the birds. They will only breed in years when the rimu tree is fruiting heavily, every 3-5 years. This is the time when the Kakapo has plenty of food to eat and become fat. Mother Kakapos will do all the work of hatching the eggs, feeding and minding the chicks. She keeps the eggs warm, and when they have hatched she has to go out to hunt for food, leaving her poor little chicks to defend themselves. Unfortunately, they are incapable of taking care of themselves and predators like rats, possums and stoats might eat them up for supper. These predators even eat their eggs, and if the mother is away too long, some of the chicks may even die of cold. Poor things! Kakapo eggs usually hatch within 30 days. The chicks will be fluffy and grey. Mother will feed her chicks for 3 months after they are hatched. The chicks will still stay with their mum for a few months after their feathers are all grown. Chicks leave the nest at about 10 to 12 weeks old. The Kakapo lives for a long time – on average 95 years old, but it can live up to about 120 years old. Unfortunately, the Kakapo is very delicious – the Maori settlers hunted them for food and also for skins and feathers to make capes. Since they cannot fly, they were very easy to catch. The clearing of forests by Maoris and later settlers has also reduced the natural habitat of Kakapo. In 1995, there were only about 50 Kakapo left in the whole world. Luckily in 2006, the Kakapo Recovery Plan was launched and the number of Kakapo is now increasing steadily.